This flight represents the first official leg of our Polar RTW trip. We will need to “close the loop” by returning to Jackson Hole within 365 days after completing the rest of the FAI requirements. Flying long distances eastbound normally has the advantage of tailwinds, but can be more tiring for the crew due to the time zone changes. In this case, we want to arrive in Iqaluit, Nunavut (located at 63N) by 1700 LCL in order to have a 13-hour rest period before departing the next day early morning for England. Given the time zone change and the almost 2,000 NM we needed to cover, we departed Jackson Hole (KJAC) just after sunrise. We planned Saskatoon (CYXE) as our fuel stop on the way north. We would have preferred to stop for fuel at a point more equidistant between Jackson Hole and Iqaluit (Saskatoon is only about 30% of the way to Iqaluit), but Canada requires your first stop be at an airport of entry (AOE) even if just refueling. Most Canadian AOEs are near the borders and Saskatoon was the farthest north we could go and still land at an AOE. The trip from Saskatoon to Iqaluit is about 1,400 NM direct and thus well within the range of our plane. The complicating factor is that alternate airports in Arctic Canada are few and far between, but the flight plan allowed enough fuel to go to Iqaluit and then, if needed, divert to an airport about 150 NM away as an alternate. Turns out that the forecast at Iqaluit was good and thus an alternate was not required, but we filed one anyway. One note about alternates in this part of the world. While Arctic Canada has a fair number of airports, many are short gravel strips and some do not stock Avgas. For example, the alternate we filed was Kangiqsujuaq (CYKG) which has a 3500 FT gravel strip which is fine for a PC12, but would not be suitable many other turbine aircraft and Avgas is often in short supply. The closest paved runway to CYFB is Churchhill (CYYQ) which is almost 800 NM away…not a great alternate. The flight to Saskatoon was a relatively quick 2.3 hours ending in an ILS approach. A quick call to CANPASS upon landing and we were cleared into the country. Saskatoon Aerocentre gave us a quick turn and we were on our way to Iqaluit within an hour. The flight to Iqaluit was smooth and VMC the whole way except for the departure and arrival. At 5.8 hours and 1390 NM (as planned), it was a long flight, but very comfortable. Much of the flight was over Hudson Bay which we had crossed on a June 2014 trip from Ireland to Jackson Hole. During the June 2014 trip, much of Hudson Bay (more than half) was ice while on this trip we saw no ice. No sure if that is a function of being two months later in the summer or climate change, but it surprised me. During the June 2014 trip we were out of communications with ATC for about 400 NM over Hudson Bay, but on this trip we had good VHF communications the whole way. I inquired with ATC and they said that VHF communications outlets had recently been installed around the perimeter of the bay thus allowing complete VHF coverage. For this trip we were HF equipped, but it was nice to use static-free VHF the whole way. For all these international flights we use ARINC Direct for flight planning which is essentially an industrial strength FltPlan.com that works globally. One of the nice features of ARINC is a flight plan optimization engine that will automatically find the most fuel efficient route. Often the optimized route is almost direct, but today’s flight was an example of where the optimization engine suggested a indirect route that was faster and used less fuel. For this flight given the distance and alternates, squeezing every last bit from our fuel reserves was nice. We arrive in Iqaluit on schedule a bit after 1700 LCL, refueled, and headed to the nearby Discovery Lodge. Carolyn and I had stayed at the Discovery Lodge in June 2014 and it is very nice and less than a mile from the airport. The Iqaluit airport has a very interesting collection of planes ranging from Twin Otters to C130s. When flying internationally, we always try to fuel upon arrival rather than departure. Sometimes fuel can be low, a single fuel truck broken-down, or the fuel truck can be busy with airlines which can cause significant delays. We’d rather deal with any delays upon arrival rather than being surprised when we show-up to depart. Also in regard to fuel, if you are flying a turbine aircraft that requires a fuel anti-icing additive (e.g., Prist), be sure to bring cans of Prist with you when flying outside the US. While essentially all airports in the US have Prist available from the fuel truck and many (but not all) in Canada do, outside the US and Canada you cannot depend on Prist availability. Because Prist can be toxic, it is important to carry the aerosol cans it in a solid, airtight container in case a can ruptures in flight. We had a nice meal at the Discovery Lodge and got to bed early in anticipation of an early departure the next morning. Our destination for the next day is Newcastle, England with a fuel stop in Keflavik, Iceland. This will be our fifth time in Keflavik, so it is a fairly familiar stop. While we have done some flying in the UK, Newcastle will be a new airport for us. Pretty cool to be able to fly from the western United States to Europe in a GA airplane with just three stops. While weather can always be an issue, with a plane that has good range and the ability to use most any airport, there are many different options for routing across the Atlantic and thus you can schedule pretty reliably. However, at around 255 KTAS, the trip will almost always require an overnight stop along the way. Leaving Jackson H0le is never easy, but we are off for another adventure. Last summer, we traveled 24,000 statute miles and Jack and Josh received their "Circumnavigator's Diploma" one year later. Today begins the process of earning the Polar Circumnavigator's Diploma...presuming they get clearance to land in Antarctica, but that won't happen until January, 2017. We refueled in Saskatoon and got our group shot, since it was dark when we left Jackson. The plane is loaded with immersion suits for six, a life raft, personal locator beacons and lots of food. Giuseppe Caltabiano was co-pilot for the first leg and the other passengers are Becky and Josh Marvil, co-pilot, and Richard Holt. We landed in Iqaluit at 5:00 local time and made a quick trek through town, admiring 15 foot tall soap stone sculptures and colorful painted metal buildings. 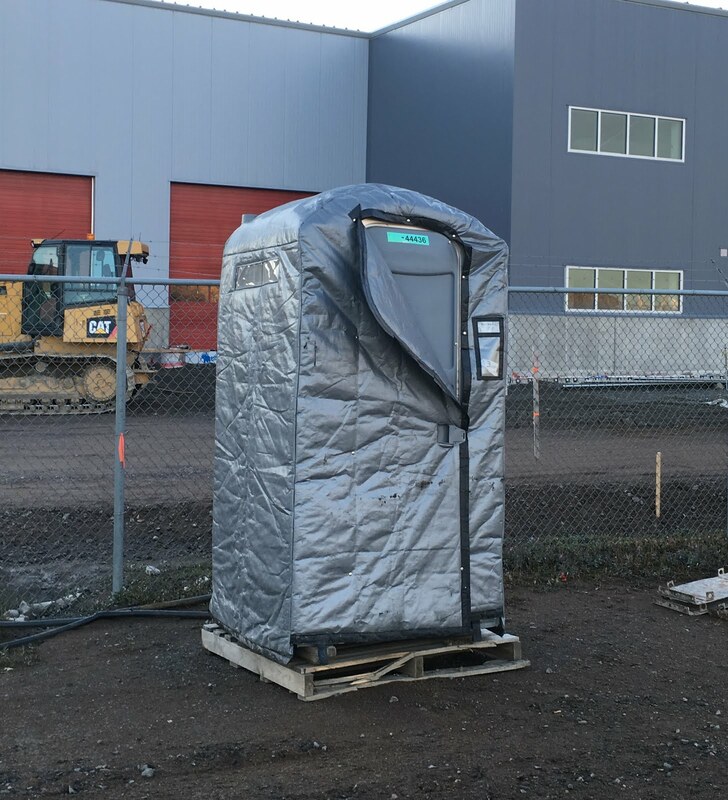 There is a new commercial airport terminal building under construction in this booming town of 6,000, located north of Hudson Bay. It is concrete and steel, but more typical construction is metal or plastic. There is a very short building window in the brief northern summer. 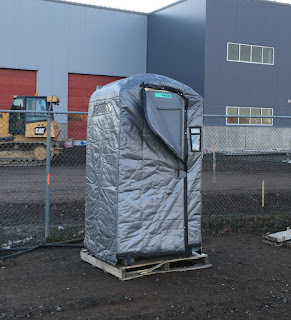 Even the port-o-pots are wrapped against the cold. Becky and I soon peeled off to look for birds. 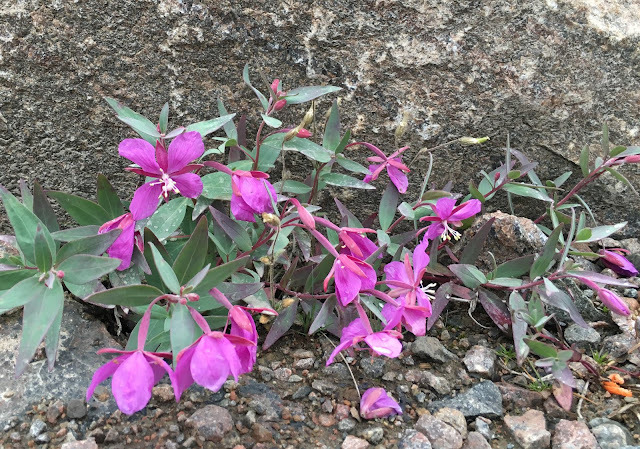 We wandered along the littered bay at low tide, and only saw a couple of ravens and a flock of snow buntings, but I did see this sweet wildflower: dwarf fire weed. Dinner at our hotel, Discover Lodge, was fantastic - everyone ordered either halibut or Arctic char...all caught fifty miles north of Iqualuit. Tomorrow we fly across the northern Atlantic with a quick fuel stop in Reykjavic, Iceland, before landing in Newcastle, England.